Dragon Fruit is still available in our place and I never miss to buy the pink one every time. 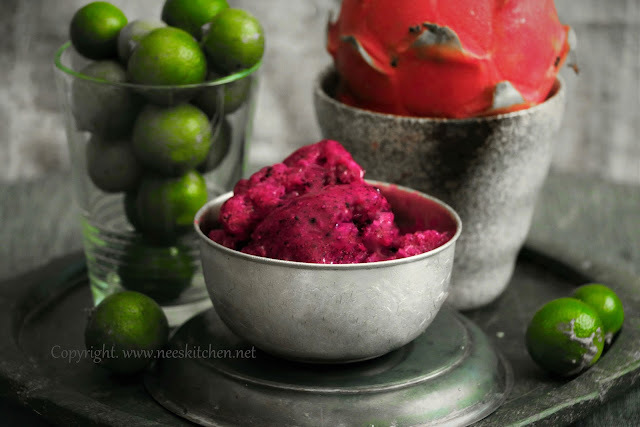 The sweetness is perfect and the fruit is loaded with fiber & anti-oxidants and they are definitely a part of our regular diet whenever they are available in the market.Sweet pink flesh dragon fruit is combined with sharp & sour kalamansi (lime) ,sugar and blended to a smooth texture and finally kept in freezer gives this yummy dessert. Pink flesh dragon fruit is in particular girl’s favorite as they are pink in color and giving them to my kid has never been difficult due to its color. 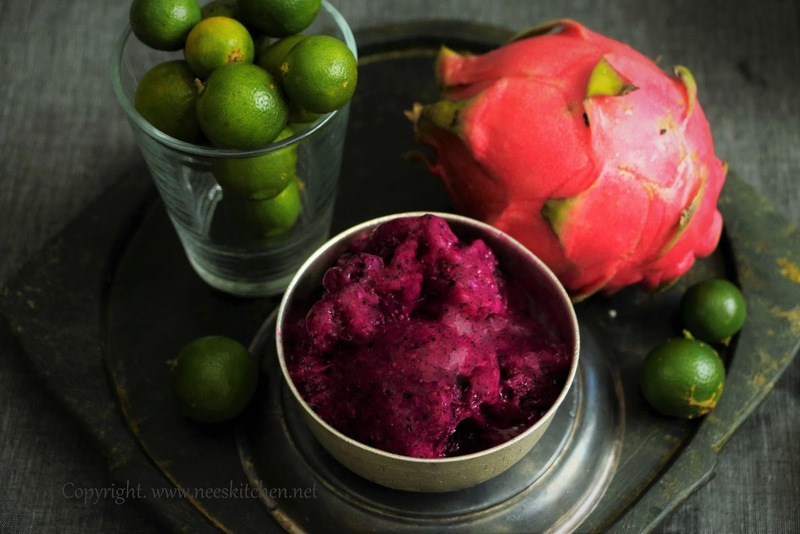 I have already listed various benefits of Pitaya in my earlier posts. Kalamansi on the other hand are small limes which are very sour in taste and they are widely used in thai, Indonesian and Vietnamese cooking. If you do not get it you may replace with lemon. 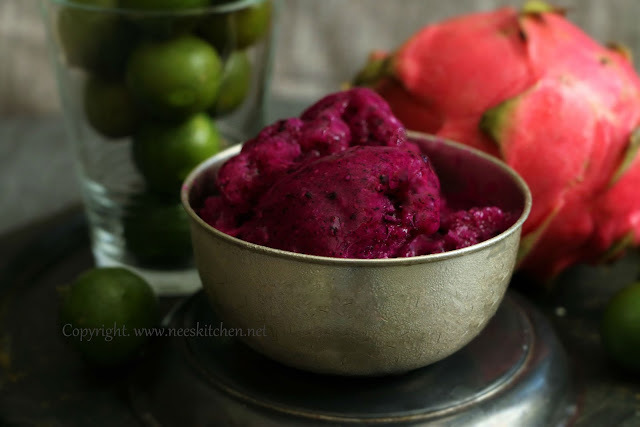 Vietnam is one of the largest manufacturer of Pitaya or dragon fruit in Asia and this is one of there famous dish. Do try out if you visit Vietnam or make them at home – its quite simple !!!. Make sure the dragon fruit is the pink one. The white one’s don’t taste much and wont suit for this dish. 1. Cut the dragon fruit into two parts and remove the flesh from the outer skin. 2. Roughly chop the dragon fruit flesh. 3. Take a mixer and add dragon fruit, sugar and Kalamansi. 4. Blend it once and check if water is needed to make it a smooth paste. My dragon fruit was ripened properly hence I never used water. 5. Blend for 5 to 6 minutes. This time is needed because we are not using icecream maker and we are using a normal mixer. Adjust the sugar and lime at this stage. 6. Transfer it to a container and freeze it for a minimum of 8 hours or overnight. 7. Before serving take out and keep it for 10 minutes else it would be difficult to scoop. You may add coconut milk if you want to be more creamy but for just sorbet this is fine. We can never predict the sweetness of dragon fruit hence adjust the sugar consistency. You may also use ice cream maker to make this recipe. Kalamansi Lime tastes the best but if you don’t have one you can use lemon but there is a chance for the taste to slightly vary. Make sure you use only very few drops else the sorbet would become sour.